When the star of Hamilton, Lin-Manuel Miranda leaves the show on July 9th, this bitter-sweet occasion will mark 10 months since Dr. Cucci made his own Broadway debut of sorts. Dr. Cucci has been hard at work, providing the chiropractic component for keeping the cast of Hamilton pain free, and mobile. when it comes to such a physically demanding schedule of a Broadway musical, you’ve stepped in to another level of demand on the body. Dr. Joseph A. Cucci took some time to reflect on treating the cast of Hamilton since its Broadway debut last year. 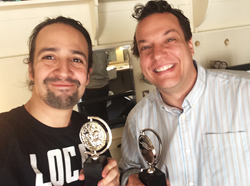 When the star of Hamilton, Lin-Manuel Miranda leaves the show on July 9th, this bitter-sweet occasion will mark 10 months since Dr. Cucci made his own Broadway debut of sorts. Dr. Cucci has been hard at work, providing the chiropractic component for keeping the cast of Hamilton pain free, and mobile. Dr. Cucci has treated theater actors in the past and was excited to work with such a celebrated actor and artist like Mr. Miranda. “The atmosphere in the theater has been so creative and inspiring.” stated Dr. Cucci as he expressed his admiration for the cast, and commented on their drive to give their very best. “The demand on each individual performer is so incredibly high. Their bodies are their temples. They have to monitor and think about their bodies every moment of every day: how they eat, how they move, what activities could be potentially harmful, are they warmed up, among other things.” He has found the experience to be challenging, and energizing, calling on all of his expertise and experience. Hamilton is quite possibly the most successful and lauded “bio-musical” of our time. By all accounts, Hamilton is a run away success. But with all that success comes the demand of expectations and grueling almost daily performances. The audience doesn’t see the physical stress, the sore backs, necks and ankles, all they get is simply put, an experience of a lifetime. Dr. Cucci has been practicing for over 16 years on the East side of Manhattan. While his office is located on East 61st street, Dr. Cucci’s most challenging role resides on Broadway. At his practice, Dr. Cucci states that his mission has been to “bring health, inspiration and improved quality of life to as many individuals and families as possible so they can live their life without limits through every stage of growth and development.” He made it a point to bring this mantra to help actors take on the demands of the stage. Chiropractic is employed by a multitude of professional sports teams, including many olympic teams and individual athletes. Its becoming more popular by the day due to the results it provides without surgical intervention or the use of medication, which can hamper physical, and sometimes mental capacity. Dr. Cucci has helped ensure that the cast of Hamilton continue to deliver stellar performances. By using chiropractic adjustments to improve performance, mental acuity, reflexes, vocal performance, range of motion, immune function, nerve function and much much more, Dr. Cucci has been helping ensure that one of the most successful shows of all time, goes on.